Poor St Thomas – We know very little about him, the New Testament hardly mentions him; in fact, almost the only thing we know of him is that he could not believe the other apostles when they told him that they had met the risen Jesus. What bad luck! For 2,000 years he has become a symbol of distrust, of a lack of good faith, of doubt and disbelief. But does he really deserve that? Put yourself in his place. Put your imagination to work. You have spent three years with Jesus. You have seen his miracles and heard his teachings. Finally you have come to believe that Jesus is the Messiah of God, the one who will usher in the Kingdom of God on earth. Imagine your dreams, your hopes for the future. But disaster! Within hours, Jesus is betrayed, condemned, tortured, humiliated, nailed to a cross and dies. Everything you dreamed, everything you hoped, has been shattered. What a catastrophe, what a disappointment! Imagine the emotional, psychological, spiritual trauma of St Thomas. Upset by this event you do not know what to think. You are lost, disoriented, blown away. A few days later you and the other disciples are still trying to cope with this huge disappointment, to rebuild your lives. And then one day you go out, and when you return you find the other apostles are in total uproar, it’s mayhem! Some are crying, others are laughing, some are singing songs of praise! It is a cacophony! Everyone runs towards you, all talking to you at the same time, everyone is excited. Finally some peace settles and you ask them “what happened?” They tell you “We saw Jesus!” “He came among us”. “He spoke with us”. “He has risen”. Perhaps the easiest thing would be to let yourself be carried along by the excitement of all the others. To tell them, “Yes, very well, I believe you, hallelujah!” but without being really convinced, with second thoughts, but not wanting to create a scene. This is why I prefer to call Thomas “honest” rather than “doubting”. He refused the easy route. He preferred to be honest, to be true to himself, to say what he really thought. When he expressed his genuine doubt and disbelief, one can imagine that it led to a heated exchange between him and the other apostles. His final words seem a bit abrupt, a little violent, perhaps they make sense only after such an exchange and pressure has being exerted on him. But Thomas did not give in, he is tough, courageous, he does not fold. I think there are many people who need to follow the model of St. Thomas. They have heard what their parents, catechists, priests, pastors have said about the Good News of Jesus Christ. They have heard others tell of their personal experiences with the risen Christ. But they find that all that is still not entirely convincing. There is something they still lack. Like St. Thomas, they need a personal encounter, a face to face meeting with Jesus Christ. If we look in the New Testament we see that there are plenty of different models for how different people come to faith. St John, the disciple whom Jesus loved, entered the empty tomb, saw the burial cloths that had covered Jesus’ body and he believed immediately, without any need for anything more. The Apostles and St Thomas himself, needed to experience the direct presence of the risen Jesus before believing. For St. Paul it took God to knock him off his horse on the road to Damascus, and to be blinded for three days and then miraculously healed, before he could believe in the risen Jesus. In my life as a Christian I have seen all of these models. I have met people who as soon as you share with them the good news of Jesus Christ, they respond directly “I believe, count me in!” For other people it’s much more complicated. Their journey to faith is often long and sometimes painful. Some even need God “to knock them off their horse” – that to bring them into some difficult, painful experience that disrupts their lives – illness, relational problem, redundancy – in order for God to get their attention, break through their cocoon, to open them up to His love for them. To me these examples show us that God respects us in our individuality, in our difference and in our doubts; as we are. For those who need proof, God is more than willing to give them such proof as they need. Jesus did not leave St Thomas in his unbelief and in his doubt. He wanted to bring him to faith. 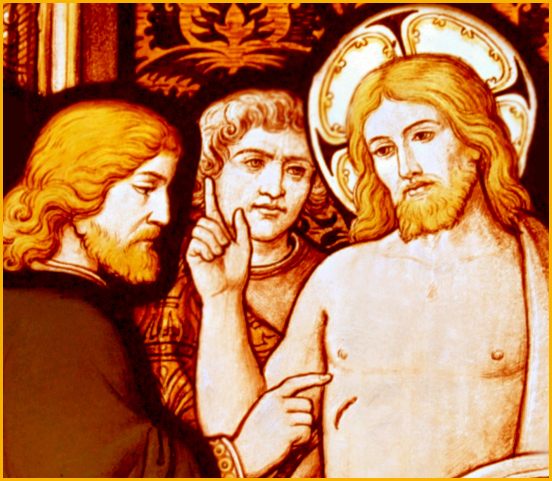 If St. Thomas needed to meet Jesus, Jesus is ready to show himself to him. If Saint Paul needs to be knocked off his horse, Jesus is ready to do that for him. Jesus has not changed. He still has the same desire to help us come to faith – the way in which we get there is of no importance. And you, where are you today? Maybe like Saint Thomas you do not yet believe. You are still missing something. You need that personal meeting, that face to face encounter with Jesus. What help can you find in the story of St Thomas? First, you need to be reassured, if you feel a desire for God that is already an infallible sign that the Holy Spirit is at work in you. Any desire for God is created by God. And God is not evil, he does not playing “hide and seek” with us. If God gives you the desire for himself, it is because he wants to satisfy that desire. In addition, note the place where Jesus appeared to the disciples – it was in the midst of the Christian community gathered together. So at the heart of the Christian community is the best place for an encounter with Jesus – at church, at an ALPHA course, at gatherings for prayer and praise. If you have the desire to meet Jesus, these places are the most favorable times. Put yourself in the places where such encounters with God most often happen – amongst his people gathered together. And for those of us who believe. For those who have received the grace to believe in Jesus, what does the story of St Thomas tell us? Imagine their delight when they finally heard St Thomas exclaim, “My Lord and my God!” What a party they must have held that night! “You will seek me and find me when you seek me with all your heart. Sermon, 2nd Sunday of Easter 2011, preached at ​​Vitteaux and Sombernon. This entry was posted in Bible, Church, discipleship, Doubting Thomas, Evangelism, Saint Thomas, St Thomas by fuelforpilgrims. Bookmark the permalink.